Getting a little more serious, I have to say I'm very uncomfortable dealing with yeast. On top of that I was extremely sad that morning, so there was not much hope that the idea of baking will at all work. But it just wouldn't get out of my mind. 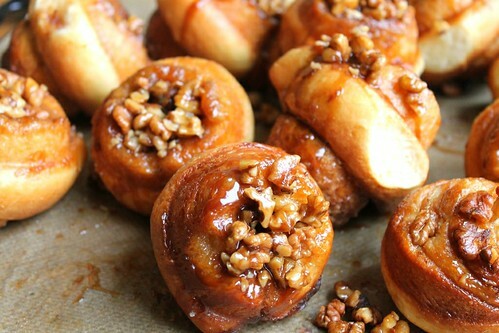 I was reading the Domestic Goddess couple of days before and got fascinated by the idea of schnecken. These are German / Jewish cinnamon roll buns and the thing is that they are cooked in a muffin pan, each in its individual case filled with soft rich and gooey maple caramel. Somehow everything worked magically. And it didn't even take long. The dough is easily mixed in the processor or by hand. It rose extremely well and fast. Rolling and slicing felt easy and comfortable. And that sticky maple caramel I wouldn't mind making every day, so pleasurable it was. I didn't even consider "cooling them down" as Nigella suggested in her recipe and had one right out of the oven. At least most of the cookies I make always taste very special when they have just been baked. So did the schnecken. My mom, dad and brother entered the house an hour or two later and they didn't even notice how they instantly found their way straight to the kitchen. They looked so genuinely happy once they had a taste. Those few buns which were left over at the table the next morning still tasted wonderful, but talking about longer storage here is perhaps irrelevant. However easy and enjoyable the process is, it is still yeast dough and it will take you no less than 1.5 - 2 hours. This is more relevant for the relaxed weekend than for a busy afterwork cooking. Another thing to mention is about authenticity. 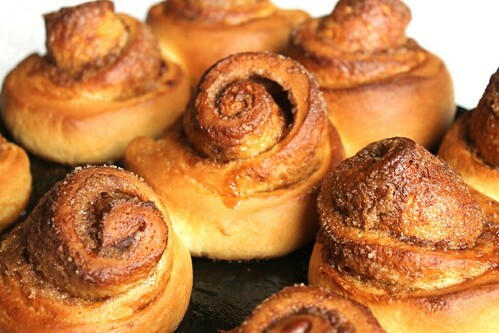 I've no idea what the traditional German schnecken taste like. Knowing Nigella's approach, these may well deviate from the classics (perhaps in the direction of cooking simplicity, but never compromising on the taste). The recipe calls for things like maple syrup, corn syrup, brown sugar etc. In Moscow they used to be hard to find, but luckily not any more. There are several online stores selling them. The one I use most often is here, though I'm not ready to argue it is the best one. I do think maple syrup and corn syrup are worth getting. What they produce is so gorgeous that even if you never used them before you are likely to find yourself doing it more and more once you start. In a medium bowl or in a standing mixer bowl combine the dry ingredients of the dough (flour, sugar, salt and yeast) and give them a quick stir. Melt the butter in the milk (do not overheat, it shouldn't boil, should feel warm when touched with your finger). Beat the eggs into the milk and butter mixture. Pour the wet ingredients into the dry. Knead for 10 minutes with your hands or for 5 minutes with a standing mixer dough hook. Now, that's important that you do knead it. Not till everything is combined and looks like dough, but for the requested 10 minutes. Just relax over this activity. It's very pleasurable actually. Put the dough in a slightly oiled bowl, turn to coat, cover with a plastic wrap and leave to rise in a warm place. It should about double in size. The process can take from 30 minutes to slightly over an hour. By "warm" place I mean something around 28-30C with no draught. In my house it is substantially colder in the winter, so I live the dough to rise in the oven preheated to 25-30C. If you go this way, be careful not to overheat the dough. It might be helpful to wrap the bowl with your dough in a large towel or blanket to stabilize its temperature. While the dough is rising, make the maple caramel. Beat the brown sugar into the butter. Beat in maple syrup and corn syrup. Mix in the nuts. Divide the mixture among the muffin cups. Once the dough has risen, knock it back. Knead once or twice and roll into a rectangle around 30 by 60 cm (12 by 24 inches). It was easy to work with and didn't stick, so I didn't flour my working surface and roller. However if you feel it's needed, do. Make the glaze by whisking an egg with two tablespoons of milk. Brush the dough with the glaze (you will probably need less than all of the glaze - just set the rest aside). Make the filling by mixing together white and brown sugar and cinnamon. Sprinkle the filling over the glazed dough. Starting from the longer side, roll the dough. Try to keep the roll a firm cylinder. 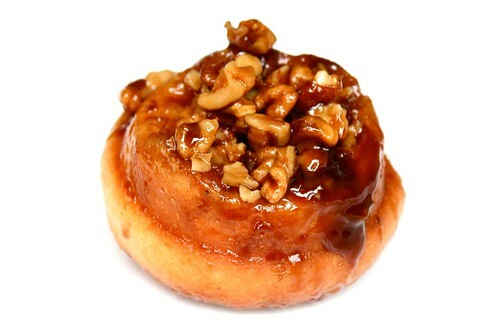 Cut the roll into 12 slices and place each slice into an individual muffin cup on top of maple caramel. Cover the buns with plastic wrap and leave in a warm place to rise once again. This will take around 20 - 30 minutes. Once they increased in size and became puffy, remove the plastic wrap and stick them in the 175C oven. It is better to place the muffin pan on a baking sheet covered with foil (some of the caramel may leak during the baking). If you were using your oven to create the "warm place", take the buns out and cover with a towel to prevent them from cooling. Switch the oven to 175C and stick the buns back only once the oven it fully preheated to the requested temperature. Bake for 20 - 25 minutes, till the buns rise well, get golden and crisp on top (see the picture above). Take out of the oven. While they are still very hot, you will need to invert them onto a baking sheet covered with baking paper. The best way is to cover the muffin pan with the baking paper, than with inverted baking sheet. Than turn the whole thing upside down, being careful not to burn your hands. Put the nuts which got stuck in the muffin pan back on the buns (or use them differently, if you know what I mean). They were perfect right out of the oven. So they were after cooling down to room temperature. Once cool, they are better stored covered with a plastic wrap or in an airtight container. Should you need to store them longer than 1-2 days, I guess fridge would be the best decision.